Does this looks like Shangri-La? Look at the smooth surface of the lake. 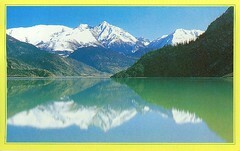 It is Rawo Tso Lake in Tibet. Kuo and Chang traveled in Tibet before they started their internship. Instead of some tribe people postcards, they sent this to me. Shangri-La is a mystery of human beings. Maybe no one is there in the real Shangri-La. But Tibet must be a good place to visit before they start to explore in the medical world.